Examples of Digital Marketing, Event Marketing and Strategic Marketing experiences I’ve gained through various marketing activities, campaigns and projects that I’ve been associated with in my life. The Ford Focus Pilot Event, was a test drive of the new 2012 Ford Focus where the participant would drive, be recorded and the video would be shared virally. The goal was to rebrand the new 2012 Focus through a physical experience and viral marketing. As a student participant, I worked in the Events Engagement Division where I helped the employees at Jackson-Dawson, engage with participants and connect event attendees to the Ford and Focus brand. I also worked in the Capturing the Experience Division where I had several integral phases of tasks and duties to perform. This was done by determining what activities during the event got potential customers more excited about purchasing a 2012 Focus and by analyzing the events attendee flow, event enthusiasm and engagement with the product. This all lead up to the creation of my written analysis for an event White Paper for Jackson-Dawson Communications and their client Ford Motor Company and its Ford Focus brand. Furthering my dedication and excellence to my work was supported from participating in this project as my submitted White Paper on the Ford Focus Test Drive Event 2012 had won Jackson-Dawsons contest for most beneficial white paper. This personal marketing experience was enhanced by my dedication and efforts in solicitation to get people to the event, and my evaluation and suggestions after the event making my efforts extremely beneficial to the program. UPDATE: This event program has now been rolled out nationally and will deliver over 35,000 test-drives and even more impressions though social media for the new vehicle. Click HERE to watch a video clip of how this event was captured as I participated in the Ford Focus Test Drive Event 2012. The “Community Connect” Project had a goal and objective of making Metro Detroiters aware of the fact they have other alternatives besides Medicaid and Medicare to help pay for medical bills and supplies. What was done to meet this goal involved me and my team and 10,000 tri-fold flyers to be distributed to emergency room personnel, discharge planners and other social workers that come in contact with low income patients that are un- or underinsured and cannot afford their prescription drugs, medical supplies, and durable medical equipment, and bed pads, adult diapers from the regular pharmacies or medical supply companies. 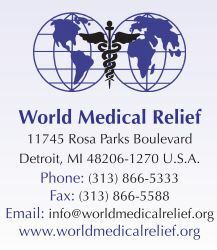 The brochure gave these patients information about how to get help from World Medical Relief’s local program. What me and my team did was above and beyond expectations was provide an organized and constantly updated spreadsheet that was readily available to all parties involved in the “Community Connect” campaign. By creating a spreadsheet in Google Docs I was able to provide an URL link to the spreadsheet for anyone to see and add to the document. This was a great way to increase our productivity, and eliminated potential communication barriers. Upon completion of the campaign a final spreadsheet was provided to World Medical Relief containing contact information for every strategically sought hospital and the desired hospital departments we had secured.